After months of rumors and speculation, Fortnite is finally available for the Nintendo Switch. Now you can hunt down Victory Royales on the go with the ease of JoyCon controllers, or at home on a big screen TV—the choice is yours. If you're a Switch owner who's new to the biggest game on earth, we have some simple beginner's tips for you to get into a rhythm of landing, looting, building, surviving, and winning. The one main thing that separates Fortnite from other battle royale games is the building mechanic. You have a world of materials around you to help build anything from a bridge to a wall for cover to a massive base in the sky, and they will all come in handy at some point. Not only that, but building is a tremendously important part of combat. If you find yourself taking fire, some times the best course of action is to build a small base, compose yourself, and familiarize yourself with your surroundings. Other times, if you find yourself getting pushed by an aggressive enemy, building yourself above or around them can disorient them enough so you can take back the fight. It's a good idea to spend a bunch of games familiarizing yourself with the game's building controls. By default, pressing A on a JoyCon will bring up the building menu, and you can cycle through the options using L and R. You can build a wall, a floor, a ramp, and a roof. Once built, you can edit structures, too. Building a ramp and taking the high ground over an enemy is always a solid idea. Once you've figured out the cadence of the building controls, use it in game. Practice by pushing up on enemies and building above them, building around them, and creating bases. It is a true key component in any Fortnite player's repertoire. 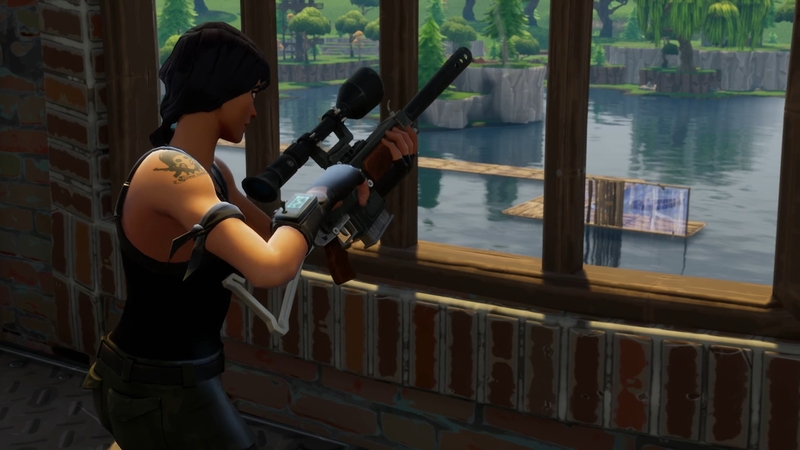 Fortnite has a ton of weapons to choose from, and a lot of them are great. But in the end, it will come down to preference on what kind of weapon you enjoy the most and are most comfortable with. All of Fortnite's gear, weapons included, is ranked by rarity and color. In general, the more rare the weapon, the better its stats are. You can check out a full list of weapon damage stats here, but in general, you will want to pick up blue, purple, and gold weapons. Once you've messed around with a number of guns in the game, an important tactic is to continue to put each weapon type in the same slot every time. This way, switching back and forth to the weapon you want becomes muscle memory. An example of this is always putting an assault rifle in slot one, a shotgun in slot two, a sniper rifle in slot three, and so on. 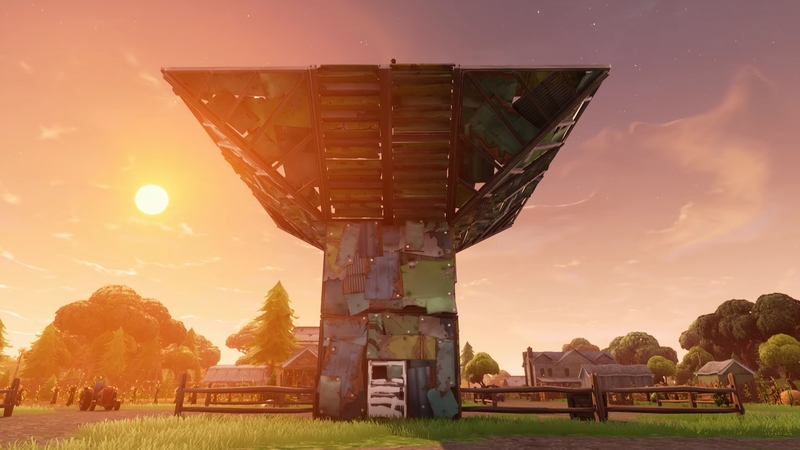 Fortnite's map is filled with awesome points of interest and landing spots. As you play the game, you will familiarize yourself with spots you like, spots you don't, spots you should land, and spots you should avoid. Spend the bulk of your early hands-on time with the game landing in multiple spots and familiarizing yourself with the lay of the land. Don't fall into the habit of landing in one spot over and over again—yet. That might come later, though. 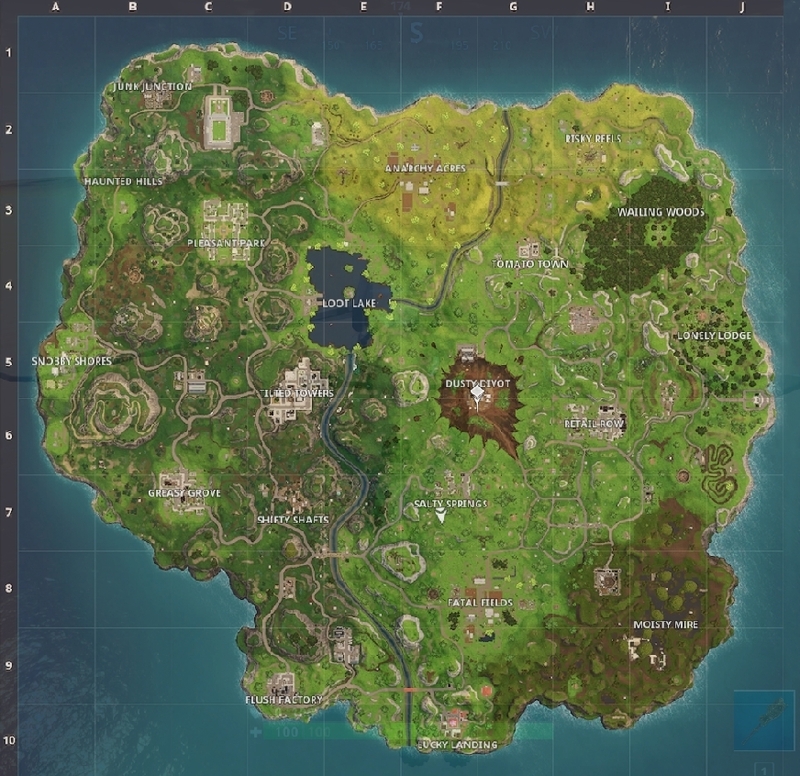 In general, some hot spots on the map where lots of people land are centralized locations like Tilted Towers, Retail Row, and Salty Springs. These are safe bets to find a lot of people early on because the Battle Bus's route will most likely be somewhere close to these locations. Landing around the outskirts of the map is a good idea if you're looking to loot up really well while simultaneously avoiding early-game confrontation. Places like Flush Factory, Moisty Mire, Lucky Landing, Risky Reels, and Junk Junction are great for this. Another key to figuring out where to land is where the storm circle is. As the game moves on, the safe circle will get smaller as the storm rolls in. Rotate around the edge of the circle to stay safe, and avoid the center to prevent being sandwiched by multiple enemies from different angles.